September is National Rice Month, and we have recipes from Minute Rice to help showcase the latest products. The Minute Rice test kitchen developed an assortment of simple yet delicious recipes featuring the new Minute Ready to Serve Rice products. To learn more about the newest Minute Rice products, tasty recipe ideas and other varieties within the Minute Rice family of products, visit www.minuterice.com. Heat rice according to package directions. In a small bowl combine rice, kale, vinaigrette, tomatoes and cucumber. Top with feta, olives and artichokes. Heat rice according to package directions. In a small microwave-safe bowl combine shrimp and chutney. Microwave on HIGH 30 seconds. Stir in yogurt, cilantro and rice. Top with peanuts. Heat rice according to package directions. Heat oil in in a large wok or skillet over medium heat. Add onion, celery and carrots and stir-fry 2 minutes. 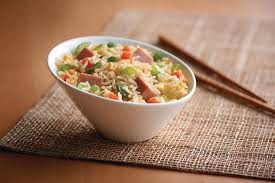 Stir in rice, ham and soy sauce. Continue to stir-fry until heated through. Pour in eggs and cook, stirring constantly, until eggs are done. Serve with additional soy sauce, if desired. Join the Minute® Rice community online at minuterice.com, facebook.com/MinuteRiceUS, pinterest.com/minutericeUS, and follow them on Twitter and Instagram at twitter.com/MinuteRiceUS and instagram.com/MinuteRiceUS/.